Tropical Storm Rick | ¡VidaMaz! We were VERY fortunate that Rick was no longer a hurricane when it reached us. The huge rough waves (all day on 20th October 2009 and the morning of the 21st), rain and sustained strong winds (from 10 pm till about 11 am) were definitely significant. Click to see individual photos in the storm slideshow above.The damage around town was still fairly significant. Trees, signs and beachside restaurants were especially hard hit. The beaches ended up with far less sand than they started with, as you can see in several of the photos. Click to see individual photos. The calm after the storm: sunset on Wednesday the 21st. Moon set with some of the fishing boats in the bay, trying to make up for lost fishing time. Click to see individual photos. A look at property damage in the wake of Rick. A look at Stone Island. Nice photos! So glad you all stayed safe. 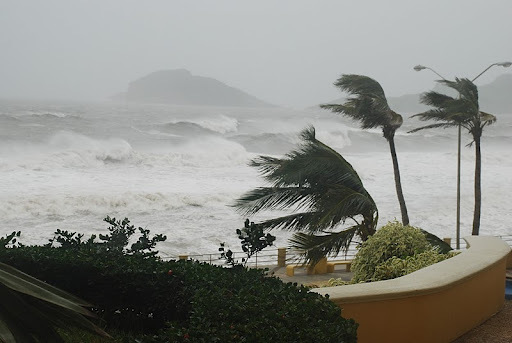 Pingback: Hurricane Willa | ¡VidaMaz!